Link: Check below for country specific link. Ann and Kate is by a company called Borders Inc (Not to be confused with the company that owns the book chain) and operates mainly in the Asian countries. It is one of my favorite survey sites that I have been using for quite awhile. This survey site sometimes recruit people for focus groups and tests as well. 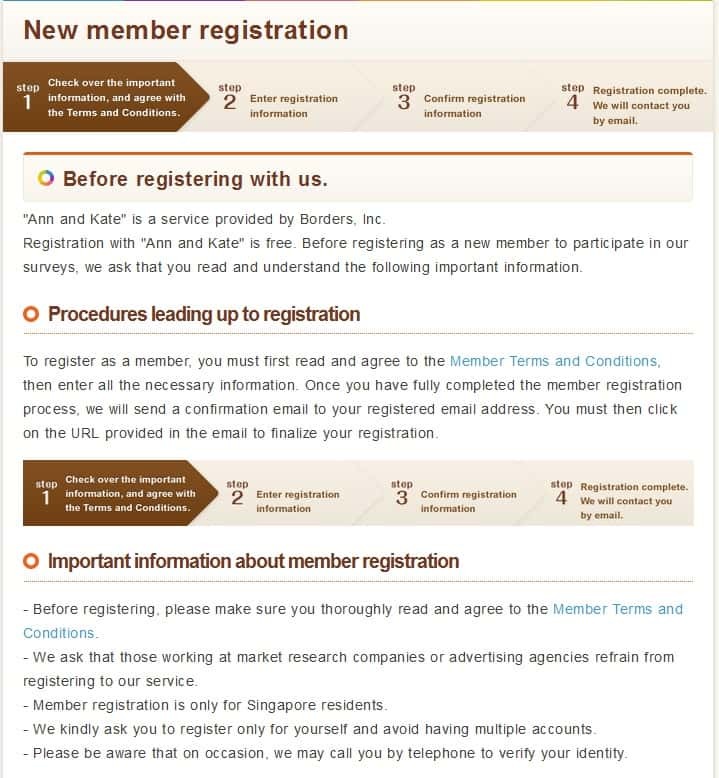 I qualified for a food tasting session hosted by Borders Inc through the website, and was paid about S$50 (US$40) for a 30 minutes session. 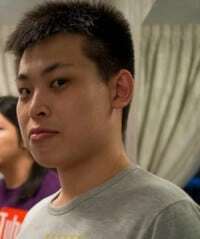 For this review, I would be using the Singapore version of the site. However, for all the sites, the layout is very similar including the design. The only difference is that some sites are localized with the country’s native language. EDIT 16/9/15: Ann and Kate has now merged into Surveyon. 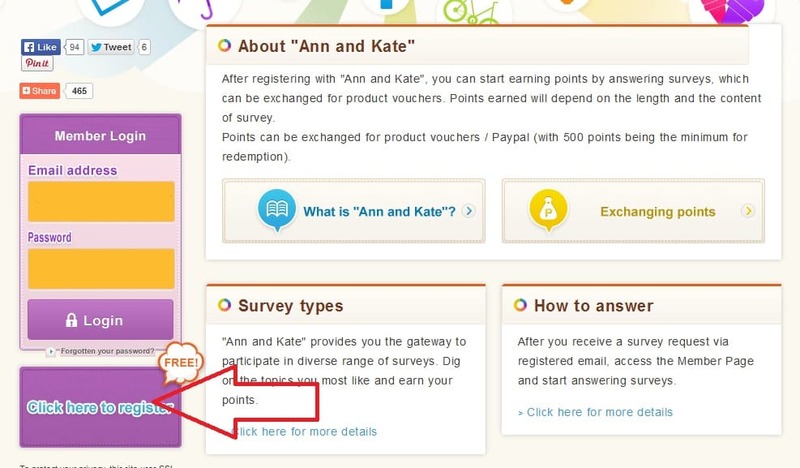 If you signed up for Ann and Kate, you will automatically have an account there with your points from Ann and Kate converted into the new point system. Check back soon as I create a new guide for Surveyon! The main page of the site looks like this for all different countries of the site. To start, press the ‘Click here to register’ button to begin your sign up process. You would first be directed to a page listing the terms and condition and important information such as how the information is used and everything. Do take a look and read through the terms so you know what you are signing up for. Remember that any survey site that omits these information are usually a scam. The next few pages would require you to fill up your personal details such as your name, e-mail and some personal statistics such as occupation, income, education. After which, you would need to confirm your e-mail before you are able to log into the website. One good thing with Ann and Kate is that there are no ‘profile surveys’ as you have done them all during the registration process. So once you are done signing up, you are good to go on taking surveys. 1. Ann-Kate Surveys – Any new surveys by Ann and Kate will pop up here. It will show when the survey is sent, the number, what the survey is about, the points and the status of the suvey. 2. 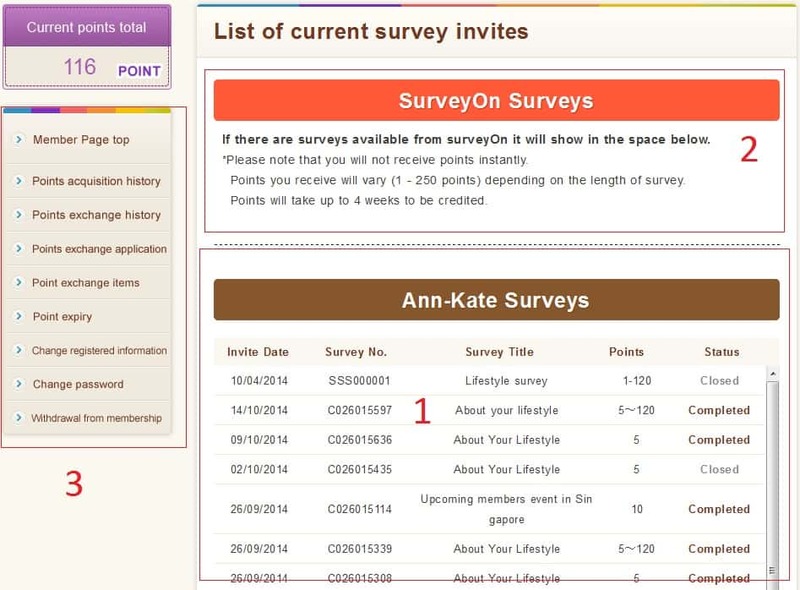 SurveyOn Surveys – These are just surveys from another company who apparently linked up with Ann and Kate. As stated, you need to wait up to 4 weeks to get the points into your account. Points Acquisition History: Shows the history of surveys you took, and how much you earn from each survey. Points exchange History: Shows you what you have redeemed so far. Points exchange application: Where you redeem your rewards (Covered in the section below). Point exchange items: Shows you the list of items you can redeem (Covered in the section below). Point expiry: Shows the terms of expiring points via – 1) Withdrawing from membership, and 2) not updating details when required by the system. Change registered information: Change your information you inputted during your registration. Change Password: Change your password. Withdrawal from membership: Cancel your account. There is a weekly survey that gives you 5 points (S$0.05) which asks the same questions. Also, when you are screened out of surveys, you are also given 5 points minimum. The frequency of the surveys is not very high, but they are fairly easy to answer. Most of the higher point surveys award about 150-200 points per survey for 15-20 minutes of work. One of the perks of Ann and Kate is that sometimes they invite people for events and focus groups where they pay people to give opinion at a venue. I did mentioned earlier how I took part in a food tasting session earlier in the post. I was actually invited to participate in a food tasting session after completing a survey on instant noodles. At the venue, I was invited to give my opinion after tasting various instant noodles. Let us just say that I got a free meal, plus I got paid for it too! The E-mail would state the important information, which are the points you can get on the survey and the number of questions so you know roughly how long the survey is. There is no direct link to the survey, so you would need to go back to the site every time there is a new survey to log in. After logging in, you can then start the survey. Every survey definitely give you at least 5 points, even if you are screened out from the survey. The cash out limit varies for different countries. 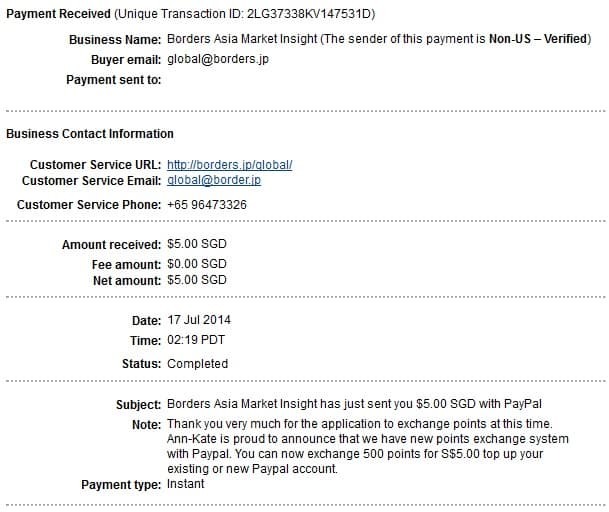 For the Singapore version, you can cash out once you hit 500 points (S$5) via Paypal. There are also gift cards at 1000 and 2000 points as well. You are required to enter your password and date of birth as verification before you can cash out. After that, you can pick what you want to redeem. If you are cashing out via Paypal, make sure the E-mail registered is the same as your Paypal. Is Ann and Kate legit? I have actually cashed out on Ann and Kate twice via Paypal. Honestly speaking, they do not pay as well as the other survey sites that I have covered. However, they are still quite legit and a great platform to work with if you are finding a new survey site! Ann and Kate is one of the sites that I usually use in my routine. 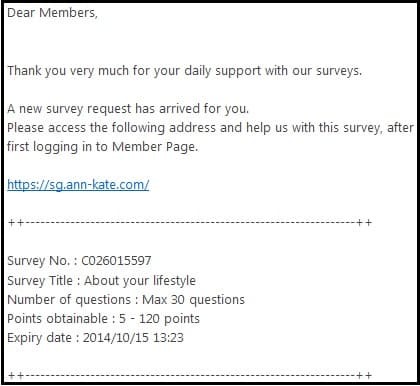 Recently, they have not been sending as many surveys besides the weekly 5 point survey. Even though they still do send me invitations for focus groups and events that are upcoming soon! If you want to make money with survey sites, you definitely need to sign up with more than one site. Do check out my list of recommended surveys right here. 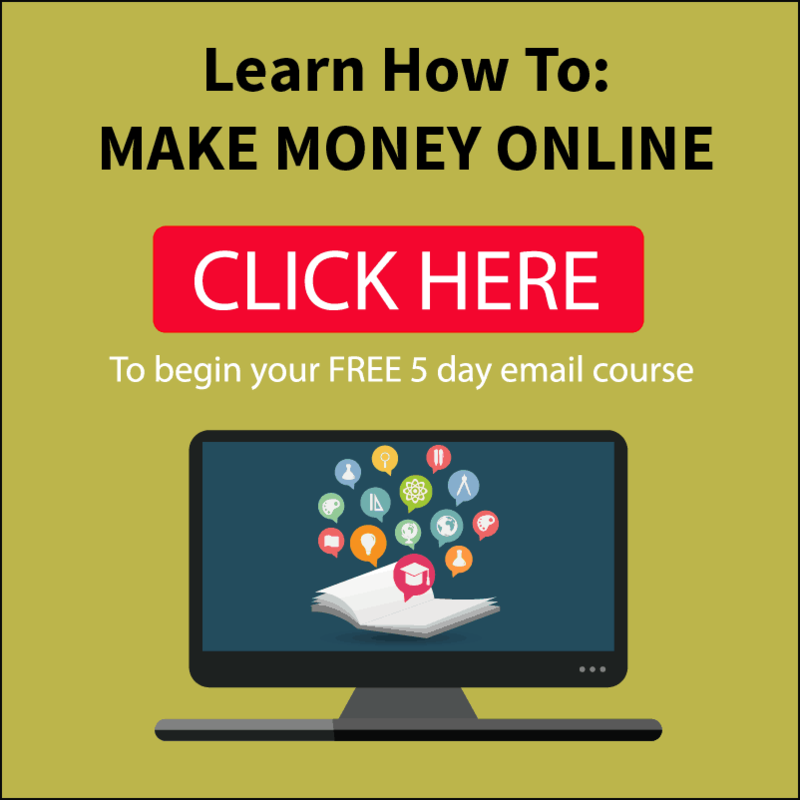 How about learning how to use your passion and interests into something to make money online? Check out my top recommendation where you learn how to build your online business by clicking below! Have you used Ann and Kate before? Let me know in the comments below!